SQLitespeed is a database manager for SQLite with greater emphasis on Database systems and software development. SQlitespeed makes the standard importing, reviewing and general working with data-sets, easier - and, as the name implies - as fast as possible. "SQLite" is one of the best RDBMS engines ever invented. The lightweight portable design, open source format and rigorous testing suite makes it the most widely used and best engine in the "lite" category (and in the top ranks of all the other categories). SQLitespeed is completely Free to use. That is: No ads, no added-functionality-upon-payment and no requirements to use. We'd like you to contribute by simply using it, reporting any bugs and sharing any ideas or requests with us. The design philosophy in SQLitespeed is to make the power within SQLite more accessible and quicker to harness for a wide audience with a bias towards software developers and development environments. 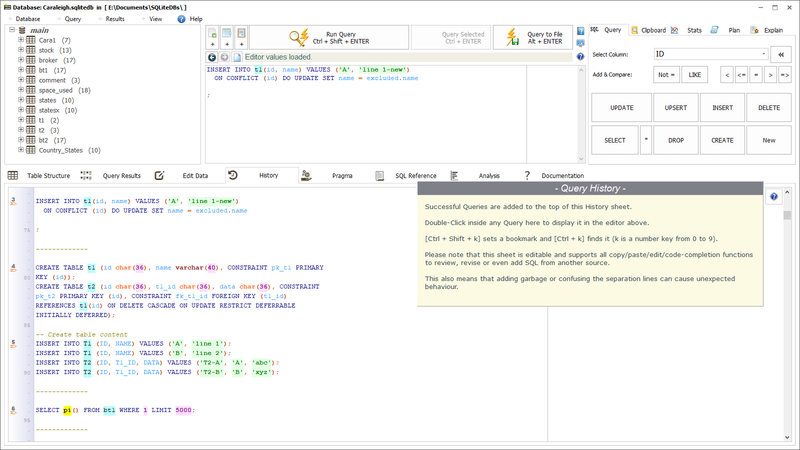 Additionally, its code completion and highlighting with quick item descriptions, fast access to SQLite help pages, and ability to view the SQL for most system functions, makes it great for learning SQL and testing queries. The software is suitable for most development cycle needs such as creating and maintaining Databases, learning SQL, Visual design interfaces and testing SQL functions and functionality. SQLitespeed sports the usual array of functions one can expect from a DB manager, hence no need to mention them all here. SQLitespeed has an easy-to-use and accessible interface but is geared towards experienced users, placing larger emphasis on speed and the actual use of the SQL language. The true quickness reveals itself more and more as you grow accustomed to the interface and layout - tuned by people who use SQLite daily. As part of the quest to be an educational experience (and not just a tool), we've include some well-documented SQL scripts to illustrate many of the SQL and SQLite tips, tricks, and peculiarities as discussed on the SQLite forum. There are of course some very advanced techniques too, for those interested, most of which contributed by the brilliant SQLite forum members. (Elect to add the example scripts during installation and find them afterward in your .../Documents/SqliteScripts folder). SQL code completion and highlighting with parameter prototypes, descriptions of keywords, functions, types and operations, and references to the owners of database objects. Two Query-History recorders - one offering live step-back-step-forward-through-recent-queries navigation, the other keeps a record of successful queries for every database in a page that is editable and fully supports bookmarks and code-completion-and-highlighting. Nearly every available function that can also be achieved through standard SQL has an option to display the SQL for it - The philosophy is to have a button that quickly does it for you when you need, but also have the ability to show the SQL as a basis for you to learn from or to craft your own more complex statements. Copy your queries formatted to any programming language, and add your own formats with the Codify utility. Easily import any tabular formatted files, CSV, Spreadsheets, SYLK, broken files, etc; Set your own format specification and fix files as you import them. Understand the size, cardinality, type and presence of import data and then edit it before the import; Model the table layout on the import data, set your own column types or let the importer automate it for you. (This functionality arose from having to regularly import and understand "dirty" data and is a cardinal reason for the existence of SQLitespeed). Easily import huge files directly - i.e. files too large to be viewed in an editor. Simply set the import parameters based on the first chunk of data in the file and start the import process. Thousands of different import layouts can be customised. Have many Queries open at the same time in "popped-out" panels to easily refer between Queries, re-run, re-use or simply have it hang around as SQL sticky-notes. Quick Documentation access - Press [F1] in any SQL key-word in the Query-editor and the documentation for it will open instantly. On the documentation page everything is easy to find and directly linked to the on-line SQL / SQLite documentation. Support standard SQLite functionality and changes up to version 3.27.0 - Not Backwards compatible with DLL's older than 3.25.1 due to support for newer Window functions and UPSERT functionality. Added "Plan" and "Explain" Tabs in the top-right pane to show the Query Plan and VDBE code explanation lists for the current Query. 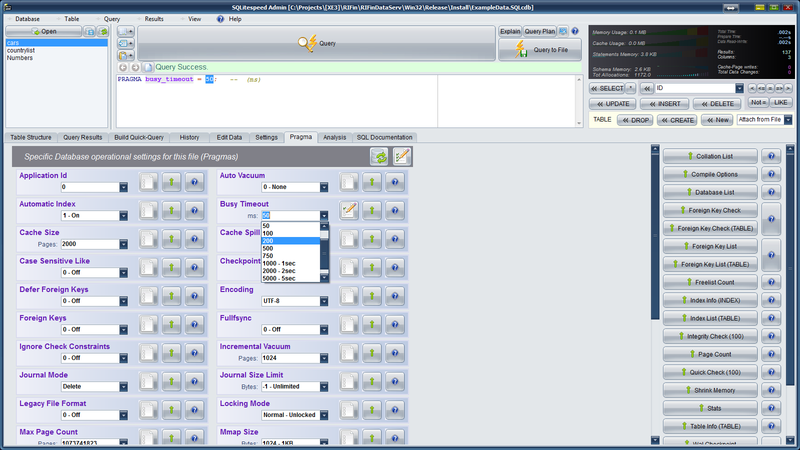 Removed old "Explain" and "Query Plan" buttons from the Query Editor section. Query Plan and Explain VDBE code may be copied to Sheets or Text via the respective right-click menus. Import to CSV File - You set the new File name and Column names. Import configurations can be "Remembered" by using the "Save"/"Load" buttons or automatically for the Import file's name. Progress bar for opening new database files (to not appear stale or "hangy" when a very large DB file takes a few seconds to open). 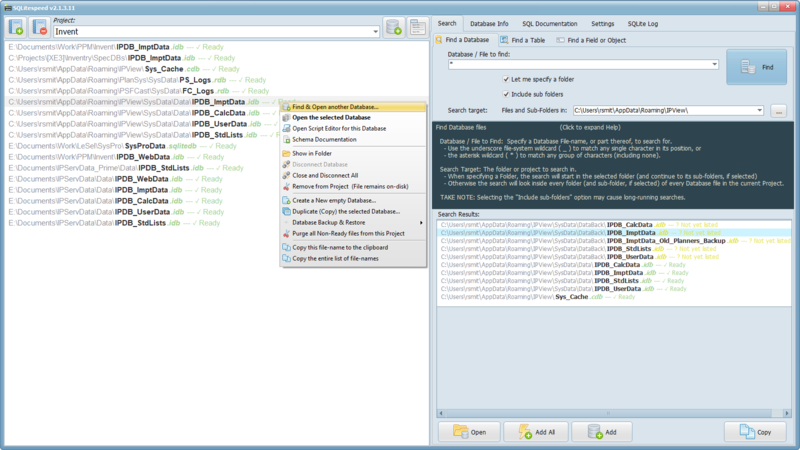 Capability to handle newer sqlite functionality: New Pragmas, UPSERTs, Window Functions, etc. New (and more sensible) Keyboard short-cuts - Hover over the question-marks above the Query editor to pop up the short-cuts list. 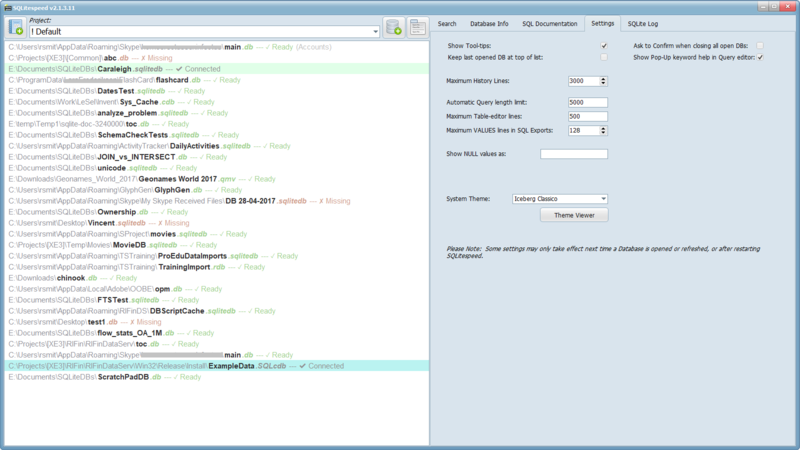 Several more GUI enhancements and bug fixes - thanks to suggestions/reports from the SQLitespeed community. Support standard SQLite functionality and changes up to version 3.24.0 - Backwards compatible with DLL's down to version 3.7.8. 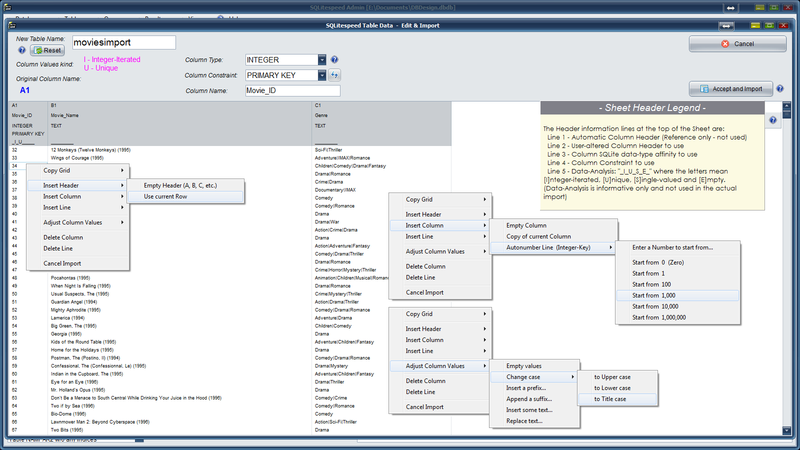 Schema tree with all attached databases, Tables, Views and all connected database objects - all with redesigned context menus. 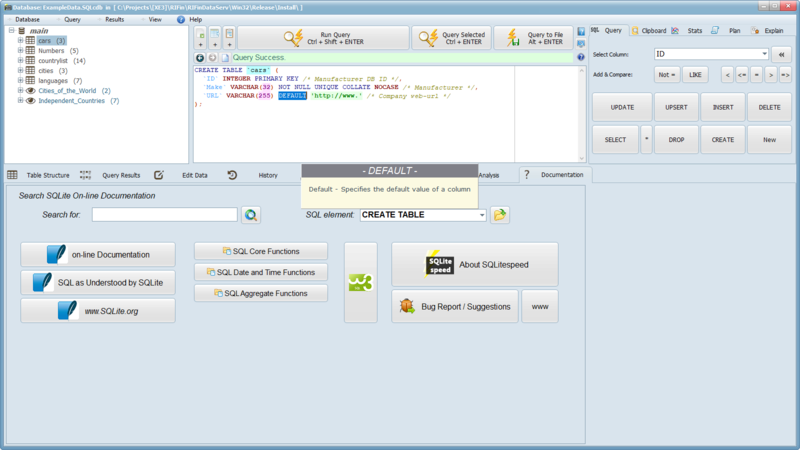 Re-designed existing, and added many more quick-SQL functions, including the newly introduced "UPSERT" functionality. 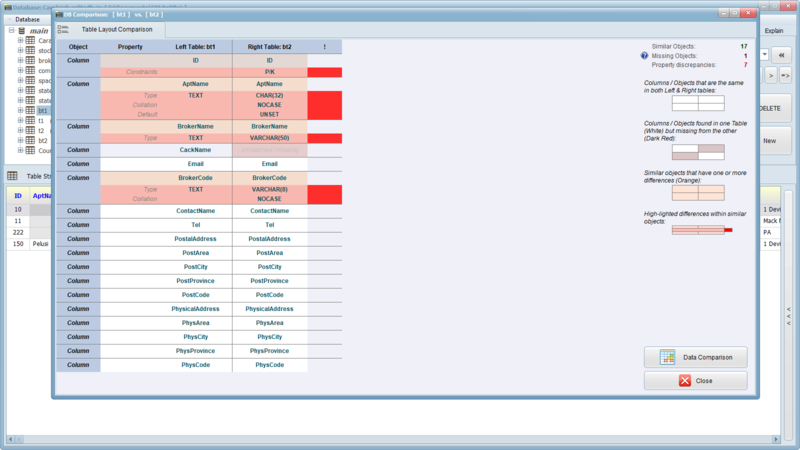 Added a Schema-Analyzer in the Schema documentation interface which will report on possible Schema problems that sometimes go unnoticed, such as misspelled variable types, warnings where type affinities might not match intended types, mismatching parent-child affinities between foreign keys, invalid or type-incompatible default values, etc. Table-values editor recording changes to SQL script which can be independently committed or copied to use elsewhere. Enhanced Query Clipboard with multiple items and the ability to iterate through clips and add/replace them into the current query code (which makes running the same query multiple times with different values, much faster). 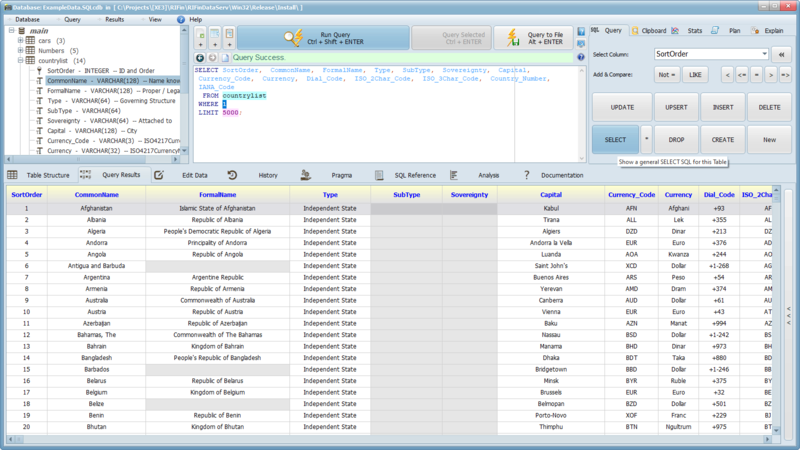 Several Table designer enhancements with the ability to handle some of the popular Virtual tables. 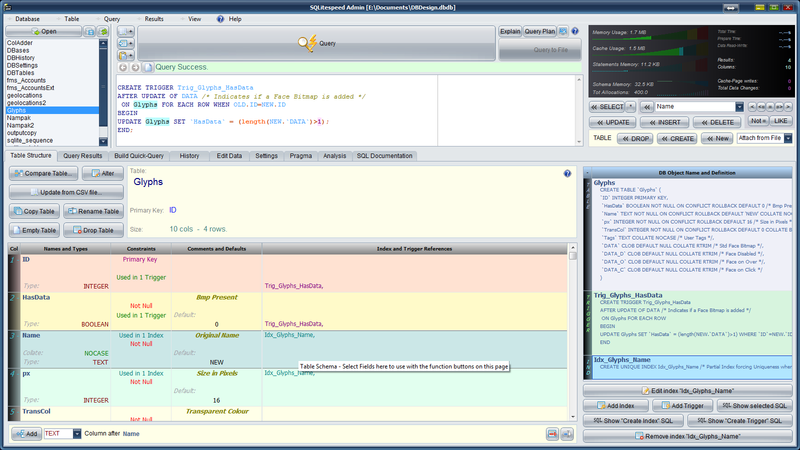 Several Editor enhancements such as inserting values via a calculator, block-commenting functions, and code-hinting on Views and View-columns. Several speed enhancements, GUI enhancements and bug fixes - thanks to suggestions/reports from the SQLitespeed community. Complete Visual designers for tables, primary/unique keys, check constraints, foreign keys, triggers and indices. Create new tables using other tables as templates - including their triggers and indices. Compare tables - highlighting differences in structure and data. Easy-reading graphical interpreter of Database statistics (Via Analyzer output). Query stats for Time taken through different phases and Memory usage. Search files among your projects, or anywhere on your computer for Databases or even specific database objects (Tables, Triggers, Indices, etc.). Quick-backup (to automatic files) and full custom backups with restores confirming data version date and time before commencing. Everything that went into SQLitespeed were chosen on a basis of: "Is it faster this way?". Whenever that answer was "no", the function got axed. Consequently, some functions you might expect to find in a DB manager may have been omitted, and although functionality are always broadening and improving, SQLitespeed is recommended as the speedy addition to your box of SQLite tools and utilities. A visual query designer (much like Microsoft Query) have some merit for novices, but we think an experienced DB user will get much faster results using the quick query buttons in SQLitespeed. This, coupled with the fact that we've had a visual query designer in previous iterations, and have not yet received one request or bug report on it, leads us to believe it is not used and not needed. Add to that a large code footprint and time-consuming test cycle, it was decided to remove it completely in version 2.1. While SQLitespeed does offer query data exports in many SQL formats, it does not offer schema or schema-data export translation to MySQL, PostGres, Oracle, MSSQL etc. at this point. Linux/Unix/WinRT/MacOS versions not available currently, but may become available in future - feel free to let us know if this is something you would want. The following on-line Resources provide great education, SQL insight or alternative systems for understanding and managing SQLite databases. Everyone working on, giving feedback / suggestions, using or testing SQLitespeed - a heartfelt thank-you to all! The SQLite developers: Richard Hipp, Dan Kennedy and Joe Mistachkin; The testers, users and specifically forum community who tirelessly answer all our questions. Icon pack providers "FatCow" over at www.fatcow.com for excellent iconic artwork. Friends and Colleagues offering direct assistance: Valerie, Davey, Ilse, Vincent and many more. The software is free to use and free to distribute non-commercially, but does not include source code. There is a plan in place to publish the source code, at which point a different license may be offered. Until then, you may use, copy and share this software at your own will and risk. Restrictions: You may explicitly not claim original content, trademark or attempt to sell it commercially. Included SQLite Libraries, extensions and binaries are graciously offered by the SQLite community in the Public Domain - See below. The software is Windows™ 32-Bit based* and should work on all compatible platforms but has only been tested on 32bit XP Pro, 32/64bit Win7, 64bit Win8/8.1, 64bit Win10. It is not compatible with Win 8 R/T 64bit, and some users reported that it runs perfectly well in Wine. Please feel free to report back on compatibility quirks on other platforms. *Microsoft, Windows, WinXP, Win7/8/10 and all similar references are all Registered Trademarks of Microsoft Corporation. This software is provided free of charge and free of any known malware, adware or any other 3rd-party software, but no official claims are made in this regard - please stay safe with up-to-date security and anti-virus software. As a security-measure, File-Hashes are provided for the executable file downloads. 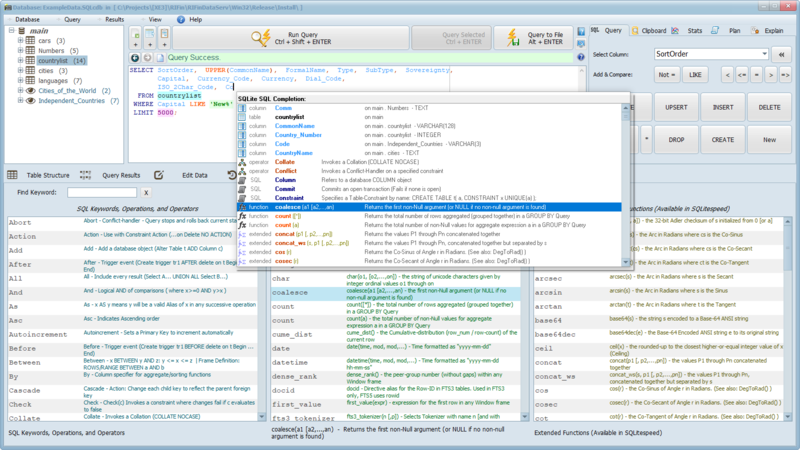 The SQLite tools included can be verified (or re-downloaded) from www.sqlite.org/download.html.